PreS-These two board books feature the cute white mouse and her many animal friends. The illustrations are done in bright, primary colors utilizing heavy black outlines. In the first title, the mouse entertains herself by drawing, playing the guitar, playing dress-up, cooking, dancing, swimming, and hugging her teddy bear. 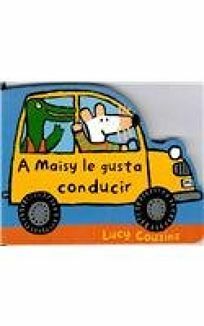 In the second book, Maisy drives various vehicles such as a train, a tractor, a car, a fire truck, an airplane, and a tricycle. Originally published in London by Walker Books in 2001, the simple texts and engaging characters will capture the imaginations of toddlers. Recommended for public libraries, nursery school collections, and bookstores. Maria Otero-Boisvert, ""Criticas""